Popped in for a pint after walking Hooton to Hoylake - had a Peerless ale which I think is local brew, was OK, could have been better. Ship Inn better bet for ales IMO. Went here for the current Wetherspoons beer festival. 6 ales and 1 cider on offer. The staff were very helpful and advised re the ales. A couple of annoying middle-aged drunks were near the entrance but it was a large enough building to get away from them. I tried 3 of the ales and took advantage of a 'meal deal'. A pleasant experience. Just a short walk from Hoylake station this pub was a pleasant surprise - it a Wetherspoons with all the usual deals and offers but it was very very friendly and had no less than 6 guest ales out of the 8 handpumps available. I stopped for two beers and enjoyed the cheery atmosphere - it may of course change on a busy Saturday night! More modern interior style. Worth a visit if you are in the area - the train service from Liverpool is very regular. Licensee Richie (not Robbie!) left a couple of weeks ago. Beer quality seems to have dipped a bit as a result following a visit last weekend. Visited early evening and made to feel very welcome. We could only stay for a couple of beers but there was a great variety of local ales on offer and the staff were really knowledgeable (Peerless Red Rocks named after a local landmark very good). I can understand why this pub was so busy as the atmosphere, prices and the quality of the ale were all great. 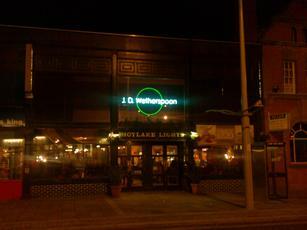 As it is situated between 2 railway stations it is also an easy pub to get to. Definitely worth a visit.